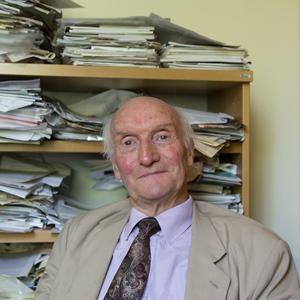 Donald Anderson was born in Swansea in June 1939 and attended both school and university in the city before becoming a barrister. In 1963 he married Dorothy Tortman, with whom he had three children. Anderson joined the Labour party aged 17 and was first sat in the Commons for Monmouth between 1966 and 1970. On losing his seat he served as a London borough Councillor, before his election as MP for Swansea East in 1974. He was twice a PPS, once to Roy Hattersley, and became involved campaigns in favour of the European Economic Community. In the Labour party he became an opposition spokesman on Foreign Affairs (1983-92), Defence (1993-94) and Shadow Solicitor General in 1994-95. Despite his position on the shadow cabinet he was not given a cabinet position by Tony Blair and instead became chair of the Foreign Affairs Select Committee. He was made a Privy Councillor in 2000 before retiring from the Commons in 2005. The same year he entered the House of Lords as Baron Anderson of Swansea. Click here to listen to the full interview with Donald Anderson in the British Library. I was not offered a job in 1997 by Tony Blair, although he virtually promised me [one]. There was a sort of ageism at this time. I remember saying to Bruce Grocott, “you and I don’t know”, and he’s a year younger than I am and was PPS to Blair, he said “oh no, effectively if you’re over, whatever it was, 55, there’s no chance.” I was fortunate then to move into the Chairmanship of the Foreign Affairs Committee. I guess if I had a government job I’d have been out in three or four years, but I was able to carry [the Chairmanship] on for two Parliaments, and I enjoyed the work on the committee. Track 1 [00:23:57] [9 March 2012] Donald Anderson, Lord Anderson of Swansea [LA]: description of family background. Parents both born in Swansea. One grandfather sailed into Swansea from Norway. [1.11.00] Talks about his maternal grandfather, an active trade unionist and founder of the Railwaymen’s Union in Wales. [00:01:45] Father worked in the local tin plate works, the Mond. Mentions father’s unemployment in the 1930s and mother’s concerns about the safety record at the works. Mentions father’s death. [00:02:30] Mentions father went to the local grammar school and then became fitter and turner. Mother passed the Eleven Plus, but went to the local secondary modern school. Worked in a local shoe shop before the Second World War. [00:03:07] Mother worked in various local shops in Swansea. Talks about Swansea community. Mother got a job in the local sub-post office. [00:03:47] Mentions sister passed Eleven Plus and joined Civil Service as a clerical assistant. Mentions that LA is only one of family to have left Swansea. [00:04:31] Mentions joined senior branch of the Foreign Office [FCO] aged twenty one. Talks about education at Swansea Grammar School. [00:05:12] Says Swansea is emotional home. Did well as a history scholar at school. Mentions Jewish friend and absence of anti-Semitism in Swansea. [00:06:00] Explains Oxbridge was unaffordable. Had scholarship to Swansea University. Comments that does not regret staying at local university. [00:06:35] Mentions A-Level subjects. [00:06:57] Mentions student activities and meeting wife. [00:07:18] Explains became president of debates in second year. Participated in Observer Debates final. Mentions friend Professor Paul Wilkinson who became terrorism expert. Became chairman of the Socialist Society in third year. Reported for BBC Wales from age of sixteen. [00:08:13] Tried successfully for the Foreign Office. Achieved a First in Modern History and Politics. Mentions History tutor, Lord (Kenneth) Morgan, who also taught son at Oxford. [00:08:49] Family was not very political. Grandfather was in the Independent Labour Party and a trade unionist. Father was more conservative. Parents were members of the Local Independent/Rate Payers Group. Recalls taking numbers for the group in teens. [00:09:45] First interested in Labour politics in the sixth form. Joined Labour Party aged seventeen. Tells story of ‘Ralph The Books’, mentioned in Dylan Thomas, and meeting the local Labour agent. [00:10:41] Went to branch meetings. Selected as local authority candidate in ward in 1965. Tells story of apologising to chapel organist who was Independent opponent. [00:11:30] Explains spoke fluent French. Worked on a farm in France aged seventeen. Travelled in the Loire Valley. Worked as a monitor at the local Colonie de Vacances. [00:12:15] Interested in international affairs. Member of the League of Anti-Fascist French Students. [00:12:48] Only white member of the Africa Society at university. Tells story of mother maintaining friendship with German girl during the First World War. [00:13:45] Mentions chaired British Parliamentary German Group and British Parliamentary French Group. Recalls giving strong answer on South Africa at final FCO interview. Helped form anti-apartheid European body in 1983-4. [00:14:41] Recalls marching through Swansea at the end of the Second World War and relief at return of soldiers. [00:15:29] Mentions Scout leaders returning from the War. Mentions was local Scout Patrol Leader. [00:15:54] Was sent to Germany by FCO to learn German. Recalls working under Sir Antony Meyer on European political relations and subsequent friendship. Worked in economic relations department. Recalls importance of experience gained of Whitehall. [00:16:38] Was posted to Hungary. Recalls wedding and honeymoon. [00:17:20] Mentions fraternity of the FCO. Compares FCO to private industry and mentions lessons learned there. Served as secretary to British-French Economic Committee, British-German Economic Committee and British-Italian Economic Committee. Impressed by dedication of public servants. Describes FCO as a “sabbatical for Parliament”. [00:18:25] Talks about National Service. [00:19:05] Mentions Peggy England-Jones who ran Swansea Labour Party. Left FCO and was offered post in history department of Swansea University. Tells story of winning table tennis tournament in Hungary against an American diplomat. [00:20:24] Describes Swansea University history department. Began looking for seats in non-Welsh speaking Wales. Describes informal selection process for Monmouth seat. Defeated David Marquand and Illtyd Harrington. [00:22:35] Tells story about membership of Foreign Service Branch Aid Association (FSBAA) union. Recounts knowing most of the local party activists. [00:23:46] Recounts questions at Swansea East selection about Europe and living in the constituency. Elected for Monmouth aged twenty six. [00:24:55] Describes Monmouth constituency and quotes Michael Foot. Mentions defeat in the 1970 general election. [00:25:57] Describes election campaign for Monmouth and differences with modern campaigning. Mentions visits by Jim Callaghan, George Thomas, Michael Foot and Leo Abse. Mentions support from Swansea students. [00: 27:36] Describes lack of factional nature of Monmouth constituency. Tells story of not knowing an answer about farming at a meeting in Abergavenny. [00:28:40] Explains effect of location of Llanwern steel works on vote in constituency. [00:29:15] Describes involvement of parents-in-law in church work in Monmouth. Describes losing to Sir John Stradling Thomas in 1970. [00:30:00] Mentions death of Sir John Stradling Thomas and support from Catholic areas of Chepstow. Describes decision to study for the Bar. Called to Inner Temple in 1969. Mentions knowing barristers from Parliament: Tom Williams, Sam Silkin, Ivor Richards. Explains choice of Inner Temple. [00:31:08] Mentions Elwyn Jones was head of chambers. Explains pupillage and describes joining the Lamb Building set. [00:31:35] Recalls other members of chambers: Robin Auld, Andrew Collins, Michael Howard, Ann Mallalieu. Served four years as a full-time barrister. Describes experience as councillor for Golborne ward in North Kensington. Mentions setting up of first urban neighbourhood law centre, West London Fair Housing Group, and first urban parish council. [00:33:30] Describes selection for Swansea East constituency. Mentions incumbent MP’s illness. Describes selection conference after death of the MP. [00:35:40] Mentions trade union representation on selection shortlist. Describes father and grandfather’s involvement with the National Union of Railwaymen [NUR]. [00:36:58] Describes selection conference. Mentions telephoned wife to ask how to answer question of living in the constituency. Nearest rival was Ednyfed Hudson Davies. [00:38:33] Mentions Swansea is not ideological. Explains that he did not interfere in local politics and respect for local councillors. [00:39:00] Elected for Swansea East at the October 1974 general election, aged thirty five. Continued to practise as a barrister. Became more and more difficult to combine with career as MP. [00:39:48] Chose to pursue career as an MP. Describes changes in the Welsh Labour Party and active Welsh table in the Commons tea room in 1966. Describes representation of the Rhondda seats by Gwilym Davies and Iorwerth (Iorrie) Thomas. [00:40:45] Mentions Iorrie Thomas was in prison during the General Strike. Describes succession of Alec Jones in the Rhondda. Mentions Michael Foot’s Welsh credentials. [00:41:57] Explains that origins and understanding of Wales still important for selection. Mentions that mother worked in local sub-post office and sister in Telephone House in 1974 and importance for local intelligence. Mentions first cousin was leading member of local Conservative Party. Talks about other local Conservatives. [00:43:10] Tells story of scholarship interview with local councillors. Tells story of local groups giving wreaths when LA’s father died. [00:44:00] Describes emotional attachment to Swansea. Is now Deputy-Lieutenant of Swansea. Tells story of station official whom LA helped while an MP. Describes meeting stallholders in Swansea market. [00:45:00] Mentions knew a little about Parliament having been in the officials box as a civil servant. Mentions wrote speech for Edward Heath which quoted Ernest Bevin. Recalls exaltation of Labour MPs elected in 1966. [00:45:58] Tells story about Jack Mendelson the MP for Penistone. Recalls did not know many of the Members. Was active in the Welsh Labour Group. Joined All-Party Groups which gave cross-party linkage. Tells story about Anthony Meyer recounting joining the Conservatives. [00:47:26] Mentions joined the British-Hungarian Group. Explains both Conservative and Labour MPs had financial interest in dealing with Communist countries. Labour MP Ian Mikardo and Tory MP Burnaby Drayson had financial links with Communist countries [00:47:51] Joined the British-German Group and the British-French Group. Recalls close links with ministers, including Richard Crossman and Anthony Crosland. Tells story of Crossman when Housing Minister putting up council house rents on eve of local elections. [00:48:59] Recalls meetings with Crossman like Oxford seminar. Tells story of Crossman shouting at civil servants. [00:49:43] Tells story of French parliamentarians visiting senior British ministers. Mentions Gérard Longuet most impressed by Crosland. [00:50:51] Mentions camaraderie of the Commons. Mentions knowing Jim Callaghan and Leo Abse. Describes positive working relationship with MP for Swansea West, Alan Williams. Recounts that Swansea constituents could see an MP every weekend. [00:51:35] Describes constituency surgery arrangements and writing letters to ministers. [00:52:03] Describes complementary skills of Swansea MPs. Mentions correcting local solicitors’ work. Describes role as like letter-writer in Indian village. Describes working with local organisations and knowing local trade union leaders. [00:54:36] Mentions attending local rugby matches. [00:55:10] Mentions Ann Clwyd was only second or third female Welsh MP. Mentions Giles Radice and the Manifesto Group. Wrote essay on reform of Parliament for collection of Young Fabian essays edited by Brian Lapping and Giles Radice in 1966-67. [00:56:21] Recalls Roy Jenkins’ candidacy for Labour leadership in 1976. Was campaign manager for the Campaign for a Political Europe and was Roy Hattersley’s PPS. [00:57:00] Tells story of joking that as Welsh non-conformist could not support Roy Jenkins who had been liberal Home Secretary. Voted for Jim Callaghan as a uniting figure. Mentions knowing most of the barristers in the House. [00:58:18] Was not ambitious, particularly as had young family. Tells story about older MPs who did not know their children. [00:59:33] Was content on the backbenches. Gave priority to Welsh Labour Group and to the PLP. Mentions tried to carry habits of a marginal seat into a safe seat. [01:00:49] Was PPS to Roy Hattersley and to Sam Silkin as Attorney General. Describes how number of full-time barristers serving as MPs has fallen. Describes rising demands on MPs of their constituencies. Describes duties as PPS. Tells story of Sam Silkin being troubled in Dulwich by Labour activist, Kate Hoey. Tells story of Elwyn Jones trying to get Ann Mallalieu into his seat. [00:03:18] Describes Elwyn Jones’ commitments as Nuremberg prosecutor. Describes professionalization of the Commons and waning of MPs’ outside interests. Tells story of Duncan Sandys’s view of role as MP for Streatham. [01:06:12] Describes going on the Welsh Select Committee in 1979. Describes lessons learned as Chair of the Welsh Select Committee. Mentions chairmanship of the Foreign Affairs Select Committee. Made front bench spokesman on foreign affairs in 1983. [01:07:38] Describes relationship with Neil Kinnock and “Gang of Six” MPs who opposed Welsh devolution. Describes speaking and voting against Labour policy and reaction of Labour Party locally and in Cardiff. [01:09:26] Mentions George Robertson and George Foulkes also foreign affairs spokesmen. Tells story of George Robertson’s description of Denis Healey. Describes role as spokesman for Africa and giving emotional anti-apartheid speech. Recalls visits to South Africa, including in 1984 when UDF members sought refuge in the British Consulate in Durban. Describes getting to know prominent members of the ANC. [01:11:40] Describes formation of Association of West European Parliamentarians for Action Against Apartheid. Describes warm relationship with Africans. Describes admiration for Conservative opposite number, Lynda Chalker. Mentions working with Jonathan Aitken when spokesman on Defence. Mentions work with the Commonwealth Parliamentary Association and the Inter-Parliamentary Union which enabled foreign travel. Was first British parliamentarian to go to Argentina after the Falklands War. Track 2 [00:00:10] Discussion about LA’s assistant. Describes staffing arrangements whilst MP. Describes taking temporary staff from outside organisations such as Educational Programs Abroad. Describes friendship with former interns. [00:02:47] Mentions staff placements from Christian organisations. [00:04:04] Describes transition to life in the House of Lords and commitments as Deputy-Lieutenant of Swansea. Mentions relationship with current MP for Swansea. [00:05:24] Mentions having many friends in the Lords before elevation. Explains was not offered a job in 1997 promised by Tony Blair. Tells story of discussing ageism in cabinet appointments with Bruce Grocott. [00:06:34] Mentions appointment as chairman of Foreign Affairs Select Committee. Lengthy description of differences in atmosphere between the Lords and the Commons. [00:09:10] Describes commitments to think tanks. Mentions event following re-election of Vladimir Putin. Mentions attendance at European Council on Foreign Relations. Consults diary and reads over engagements. [00:12:02] Describes interventions of Baroness Finlay of Llandaff in debates on the NHS. [00:12:26] Mentions membership of the board of Mercy Ships with Lord McColl. Describes pattern of working week. [00:13:35] Describes social engagements in Swansea and relationship with local councillors. [00:14:38] Discussion of decision to stand again for Parliament in 1972. Recalls considering selection for Aberdare seat. Tells story about missing out on selection for Edmonton to Ted Graham. [00:15:47] Recounts luck in career at the Bar and as MP for Swansea. Discussion of highlights of parliamentary career. Mentions victories for individual constituents and on the Foreign Affairs Select Committee. [00:16:40] Tells story of being over-ruled in favour of an inquiry into the Iraq war. [00:17:34] Tells story of filming programme for BBC Wales on referendum into increased powers for the Welsh Assembly. [00:18:56] Mentions that differences are often not made to policy but on the margin. Describes view of the importance of the select committees and links with outside experts and academics. [00:20:45] Describes role of select committees as part of the pressure on changing policy. [00:21:18] Describes increasing importance of television to campaigns. Mentions that pressures, salary and press attention deterred sons from standing for Parliament. [00:23:40] Discussion of salary differences between a barrister and an MP. Describes view of money.